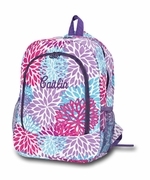 Back to school backpacks for girls monogrammed. Looking for a gift for a young and trendy girl? This backpack will delight her with its cool mint color and swirling white graphic geometric pattern. The zippers contrast in a fun feminine pink creating curvaceous shapes on the top and front. She can use the backpack for school, visiting friends and when setting off with the family for a day outing. The large main compartment closes securely with a zipper and can hold clothes, shoes, magazines, and towels. The front zippered pocket is ideal for smaller items and that all important mobile phone can slip into the side pouch. Matching lunch tote is available search item MS-20182 for a back to school set. Personalized and embroidered geometric backpack measures 17"H x 13"W x 5" across the bottom. Padded over the shoulder carry straps or hand carry handle. Lined with two side gusset pockets.